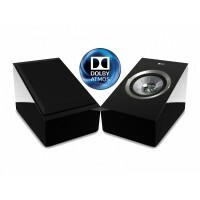 B&W DS 3 Dipole Speaker Dipole Speaker DS 3 The DS3 is a wall-mounted surroun..
Cambridge Audio Aero 3 Dipole Speaker Premium surround speaker Aero .. PLANET L Following in the Elipson tradition, the Planet L is a superb compact s.. PLANET M Elipson is introducing a miniature version of this iconic ..
Focal Aria SR900 Surround Black Home Cinema with effects! ARIA SR 900 ..